Renowned palm reader and spirituality author Richard Webster shares the deep wisdom he's gained through his decades-long career. 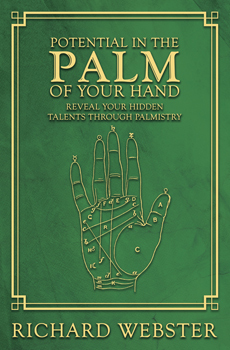 Potential in the Palm of Your Hand guides you through the beginning principles of palm reading and provides detailed descriptions of more than forty lines and features of the hand that every reader needs to know in order to achieve success. This book shows you how to help those you are reading for recognize their hidden talents and reach for their dreams. By learning to read the textures, quadrants, mounts, prints, and other aspects of the hand, you will uncover artistic abilities, leadership traits, and personality characteristics that people never even knew they had. When you develop your own talent for palm reading, you will be amazed at how much you are able to bring joy and happiness to the friends, family, or clients that you read for.